Nutrition supplement manufacturer ClifBar is telling the press down at the Nova National race this weekend in Arizona that they are about to bring out a new product called Clif Cibble (pronounced like "kibble"). 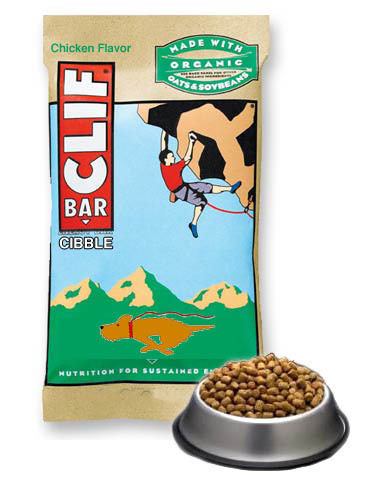 Similar in shape to the dog food of the same designation, Clif Cibble is designed for "riders and their dogs", according to spokesperson Bob O'Waugh. "We know that mountain bikers like to take their dogs with them when they ride, so we wanted to come up with something that would provide both the cyclist and the dog with the optimum nutritional support for their efforts. We also wanted a product that could be carried on the trail and provide a quick energy source to both participants in the ride, enhancing the bond between rider and canine." Clif Cibble will come out first in a Chicken flavour, with Lamb and Rice and Beef Stew to follow. At Nova, a few samples were being provided to try out. It consists of semi-soft nuggets, which are chewy and taste like ... chicken. The dogs seemed to like it. ClifBar says that Clif Cibble will be introduced at the Interbike trade show this fall, and will be in shops by the end of October. Along with the racing, a special event took place yesterday evening before the Criterium at the Nova National - a wedding between racers Max Plaxton and Trish Sinclair. Plaxton and Sinclair have been a couple for over two years, and decided only in the last couple of weeks to tie the knot in Arizona. "Yeah, it is sort of a Las Vegas thing." said Max "We figured everyone was going to be here, it is a beautiful place to do it, why not?" "Plus, I'm not getting any younger!" chimed in Sinclair with a laugh. The ceremony was held prior to the start of the women's criterium, in downtown Fountain Hills, with most of the Canadian race contingent taking part. Plaxton's new Rocky Mountain-Haywood team mate Seamus McGrath was the best man, with Mat Toulouse giving away the bride and Alison Sydor and Lesley Tomlinson performing bridesmaid duties. Eric Wallace (former Trek and Maxxis team manager, now with Thule) performed the ceremony, since he is also a licenced minister (Universal Church of the Holy Roller). The new Sinclair-Plaxton couple will take a few days to honeymoon at the Grand Canyon after today's cross-country, before Max returns to preparing for the World Cup season (see our posted video interview with Max later today). Our editor was pressed into service as the wedding photographer - a few photos can be found here. Our best wishes to the newlyweds! It appears that a solution may be on the horizon for the ongoing battle between the UCI and the Grand Tour organizers, with the GT organizers announcing that they have reached an agreement in principle to purchase the assets of the UCI as a consortium. According to UCI staff - some of whom are reported to be very unhappy by the move - the UCI will continue to run as a wholly owned subsidiary of the consortium, which has been tentatively named IFE (Italia - France - Espagne; pronounced "iffy"). The Board of the IFE will consist of 12 members - 3 each from the GT organizers, and 3 appointed by the UCI. The ownership structure will be 30% each for ASO (Tour de France) and RCS (Giro d'Italia), and 20% each for the Vuelta and UCI. While the GT owners will mainly take a hands-free approach, there is expected to be one immediate outcome: the demise of the ProTour. Pro level road racing will revert to the old system of event ranking and points structure for 2008 - which will certainly benefit Canada. According to UCI insiders, the inital proposal for the purchase came from ASO last fall, and was rejected. 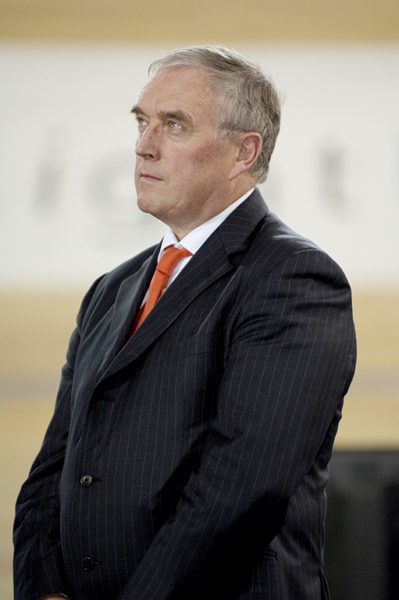 However, as the disagreement between the two sides dragged on, and eventually saw the top ProTour teams get involved last month, UCI President Pat McQuaid began to reconsider. The agreement apparently came together quite quickly, with the only sticking points being a GT organizer demand that no Belgians be allowed on the Board, and that mountain biking and BMX be ditched by the UCI. The Belgian requirement was eventually struck down after it was pointed out that EU regulations would not allow it. The expulsion of mountain biking and BMX has been tabled until after the Beijing Games, and a study group will be formed to look into it further. The UCI insider said "at the national level, organizers and teams won't notice much difference, they will still work through the UCI for licencing and event date setting. The only place where it will be noticable will be the requirement that all organizers pay a tithe to the IFE."